For the last several months, people have been asking me what I think is going to happen on October 1. Will vendors be completely ready? Will customers have time to take upgrades and patches? Will users have enough time to test and practice new workflows as well as learning new documentation standards? Will things come to a screeching halt? Or will it be like Y2K and turn out to largely be a non-event? I’ve been telling them that I think the majority of systems are going to be ready, but I think that there will be some glitches. Although I don’t anticipate complete chaos and the breakdown of civilized medicine, I have been recommending to my small practice clients that they should prepare for delays in cash flow and consider having access to a line of credit to cover expenses if there are lags in payments. I’ve helped most of my clients develop business continuity plans so they’ve already thought through various scenarios and it’s just a question of applying ICD-10 problems to existing plans. Larger practices, especially those owned by or affiliated with hospitals and health systems, appear to be pretty well prepared. 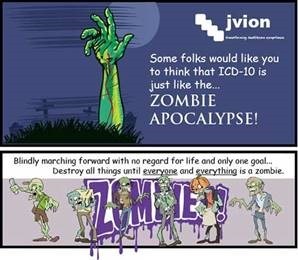 Several that I’ve worked with have fleets of staffers dedicated to ICD-10 preparedness, from coders and compliance officers to EHR trainers. Nevertheless, most of them have increased the amount of cash they have on hand. They have also prepared to bring on extra staff to help them power through the glitches through a combination of manual data entry and brute force if it is needed. All of the groups I’m working with have come to accept that the odds of a delay or reprieve are miniscule. I’m encouraging them to be cautiously optimistic but to continue preparing and drilling. There are so many moving pieces in the medical billing process and so many different systems and vendors involved. Although a practice might be prepared, what if their billing clearinghouse drops the ball? Or what about failures on the payer side? There are bound to be glitches. Unfortunately, there will also be catastrophic failures. I came across one of those situations today when I received a frantic phone call from a prospective client. They’re using a specialty-specific EHR that started behaving erratically this week after turning on the ICD-10 dual-coding functionality. Apparently the system didn’t have the level of code mapping they anticipated, but it wasn’t discovered before it went live because they didn’t thoroughly test it. They are unable to revert the feature and were told by the vendor that they need to very quickly do a code mapping and setup project. Due to the number of providers, the complexity of the build, and the skills of the IT support team, there is no way the practice can fix it in time for ICD-10, let alone fix the issues they’re currently facing. Several of the problems are patient safety issues. On a pediatric chart, selecting a simple diagnosis of sore throat in ICD-9 is recording an ICD-10 diagnosis for Ludwig’s Angina, which is not only uncommon in children but also life-threatening. Needless to say, the physicians are struggling and the practice is in full freak-out mode. Although I’ve not worked with this specific system, I told them I was willing to take a look under the hood and see if I could help. I had to wake up my database guy early on a Sunday morning, but luckily he’s always up for a challenge. After a couple of hours of massaging the data in their test system, we put together a plan and the client agreed to our proposal. We extracted the data from the relevant tables and I’ve spent most of the day comparing it to the CMS General Equivalency Mapping data. Our goal is to very quickly identify the data that is correct and stage it against their historical diagnosis patterns. We’ll validate their most frequently used diagnoses first and load it back into the system in batches every night. Then we’ll work our way through the rest of the data in order of frequency of use. Although we can’t turn the dual coding feature off, we’ve completely wiped out the ICD-9 to ICD-10 crosswalk so that they can at least code without fear of adding incorrect data to their charts. 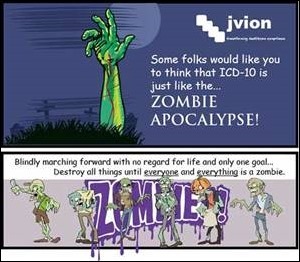 Once we start adding data back in, if there isn’t a clean ICD-9 to ICD-10 map, they just won’t get an ICD-10 code. I was able to juggle some of my other commitments and hope to be ready to test the first batch of data later tonight. In the mean time, we’ll have a contract coder going through the charts where ICD-10 codes have already been applied, suggesting corrections as needed. Due to the volume of codes that we need to examine and the premium they’re paying me to do it quickly, I’ve been chained to my laptop most of the day. I see code tables when I close my eyes and I’ve started to feel like an ICD-10 apocalypse might be on the horizon. I found some tips from AHIMA on how to survive such an event. Do you have your medieval mace and leather armor ready? Email me. Think of how many other panicking health care organizations there are paying premiums to consultants–not to say that many of them are not worth the money! Just sayin’ what a “system.” Hopefully one day we shall return to the core value of keeping people health instead of focusing on paying for it.